Image by Marcus-Trapp via Pixabay is licensed under CC0. Firearm use is responsible for nearly 40,000 deaths and 80,000 injuries yearly in the US, with 2018 statistics marking the highest such rates seen in decades. Identifying focused, effective ways to reduce firearm violence is of significant public health interest. 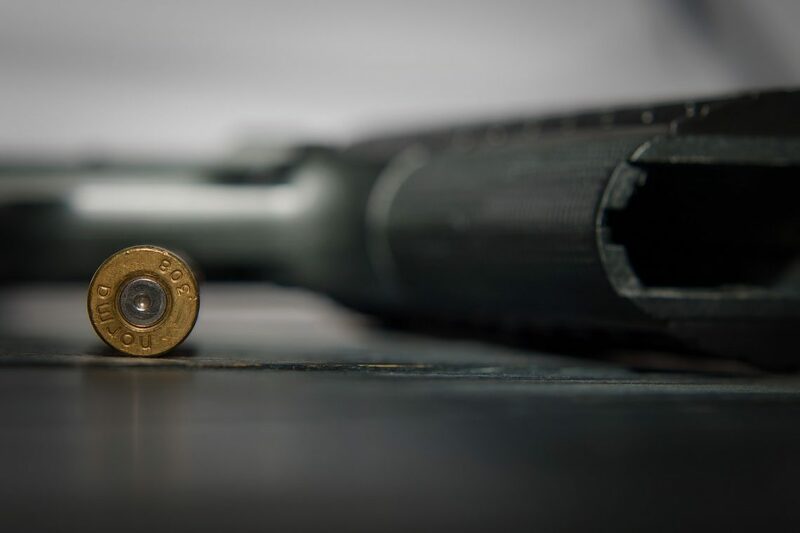 Legislation restricting access to or carriage of firearms is a key harm reduction strategy, but research is needed to identify and document the effectiveness of laws that target specific categories of firearm violence for maximal impact in reducing death and disability. Our work addressed intimate partner homicides (IPH), responsible for nearly 1800 deaths annually, of which 85% of victims are female. Firearm-related homicides account for over half of these female deaths. We focused in particularly on the role of firearm use in female IPH. Certain laws—such as universal background checks–have been associated with a benefit in reducing the overall number of firearm deaths; nevertheless in IPH, specific laws that target a documented abusive intimate partner have been under increased study to extend the reach of such general measures. Indeed, prior research has demonstrated that intimate partner violence is evident far before these killings, offering the opportunity for intervention before a homicide is committed. Access to firearms is clearly linked with increased likelihood of use in multiple studies. For example, prior research has demonstrated between a 5- and 6-fold increase in risk of IPH when ﬁrearms are in the house where partners cohabitate. Accordingly, laws that are of interest in firearm injury prevention, and have been investigated by numerous researchers in the field include: (1) Prohibition of ﬁrearm possession by persons convicted of intimate partner violence (IPV)-related misdemeanor; (2) Persons convicted of IPV-related misdemeanor prohibited from possessing ﬁrearms and required to surrender ﬁrearms they already have; (3) Prohibition of ﬁrearm possession by persons subject to IPV-related restraining order; (4) Persons subject to IPV-related restraining order prohibited from possessing ﬁrearms and required to surrender ﬁrearms they already have; (5) Removal of ﬁrearms from the scene of an IPV incident required; and (6) Prohibition of ﬁrearm possession by persons convicted of stalking. Firearm legislation varies considerably by state. In those states with heavier firearm restrictions (we called these “high” restriction states), certain legislation limits accessibility to firearms among persons with a history of intimate partner violence. Many others, with lower firearm restriction (“low” restriction states in our analysis), have none of these IPV-specific provisions. In turn, the highest rates of firearm-related IPH are observed in those states with greater firearm access. This trend, alongside other published data, suggests that an increase in firearm legislation may be associated with lower rates of IPH. The aim of our research was to explore these associations by comparing types of weapon use in intimate partner homicide rates in states with differing levels of firearm legislation. We used data from the National Violent Death Reporting System (NVDRS), the only state-based surveillance system of its kind, which combines data on violent deaths from numerous sources (such as death certificates and law enforcement reports) but also provides detailed information on circumstances precipitating violent deaths including linking of sources and multiple related deaths to portray patterns to aid in policy planning. We accessed the most recent NVDRS data through the Web-based Injury Statistics Query and Reporting System (WISQARS), which is a publically available online interactional system providing NVDRS data on injury and violent death. Our research was original because we took a ratio approach: we compared rates of firearm to non-firearm (cutting, stabbing, striking, strangulation, etc. )IPH to generate ratios, hypothesizing that in states with greater firearm restrictions the ratio of firearm deaths would be lower than the ratios calculated for states with fewer firearm restrictions. The rationale for the comparison was that it provided at least a crude way of controlling for the violent nature of the intimate partner in each state; we reasoned that our approach might provide a view into the problem of whether states with highest restrictions also had less violent perpetrators and that this explained the seeming effectiveness of intimate partner-specific firearm possession laws in that state. We calculated ratios for the data available, which varied in the number of cumulative years for the 27 states available in the interactive database. Our research had 3 main findings. First, the ratio of firearm to non-firearm use was, as expected, much higher where the homicide victim was a woman (ratio 1.5 for female victims, 0.92 for male victims). Firearms are used by male intimate partners to kill females at a much greater rate than they are used by female intimate partners to kill males. Second, firearm:non firearm homicide rate ratios for jurisdictions with more firearm restrictions were < 1.0 (mean 0.47), while jurisdictions with fewer restriction showed ratios > 1.0 (mean 1.9). In the former case, other methods of homicide were still used – and used at a greater rate than firearms. This suggests that specific legislation for firearms may have an effect on firearm access and use, rather than the alternative hypothesis that the lower homicide rates are attributable solely to the population of those states being less violent. Firearms are used in the majority of female IPH in states with lax restrictions, but not in jurisdictions with tighter regulation. Third, we found that the use of other lethal means of homicide in some “low” firearm restriction areas varied —for example, in Kentucky and Oregon, use of non-firearm methodswas relatively low. Nevertheless, even in these states, firearm homicides were consistently high and comparable to that in other “low” restriction states. This finding provided additional weight to the argument that firearm legislation can have a targeted effect on firearm use, and that availability of ﬁrearms by itself plays an important role in driving IPH rates higher in these areas. These data—although certainly with limitations due to the methodology and scope—nevertheless oﬀer another window into the degree to which firearms drive female IPH, and provide further evidence that a focus on implementing and enforcing eﬀective ﬁrearm legislation could reduce female deaths perpetrated by intimate partners. These findings are described in the article entitled Firearm legislation and firearm use in female intimate partner homicide using National Violent Death Reporting System data, recently published in the journal Preventive Medicine. Dr. Erica L. Gollub is an Associate Professor in the Health Science Program at Pace University College of Health Professions. Her research focusses on diverse areas of gender and health. Morgan Gardner is a student in the Pace University Bachelors of Science in Health Science program.